Philips SpeechLive is the ultimate cloud dictation workflow solution that makes going from recording to written document quicker and more convenient than ever before. You can even access your files via a web browser, anywhere, at any time. Downloading additional software is not necessary. You can record, upload, play and download dictation files, send them to your assistant or have them transcribed using speech recognition software or our transcription service with professional, industry-specific trained transcriptionists. Record your ideas, tasks and documents wherever you are and send it to SpeechLive. All your recordings are safely stored in the cloud. Choose whether you want to send your recordings to your assistant, the Philips SpeechLive online speech recognition service or the Philips SpeechLive transcription service. Save time and resources by letting others do the typing for you. You can receive your recordings as finished text files straight to your email. Access and manage your dictations through your browser from anywhere or through your SpeechExec dictation workflow software loaded on your computer. – Dictation can be made from an office, hotel room, home or even on the beach, in fact anywhere on the move no matter where you are in the world using the Smartphone App, Philips SpeechAir Smart Recorder, or from your laptop or PC. – Transcription from home or remote office is also no longer a problem, as you can safely use your private computer to playback and transcribe recordings. keeping your data reliably secure and available at all times. Adapt the solution to your company’s way of working. Administrators can easily define authors and typists, as well as assigning the workflow from anywhere in the world, to balance workload. SpeechLive works perfectly with Philips dictation devices and can easily be implemented into your existing workflow. SpeechLive even supports mixed environments, where not all users have access to SpeechLive. SpeechLive adapts to suit the needs of your business by giving you the opportunity to adjust the number of users at any time. You can use SpeechLive with your Philips voice recorder, your Smartphone or even both at the same time. 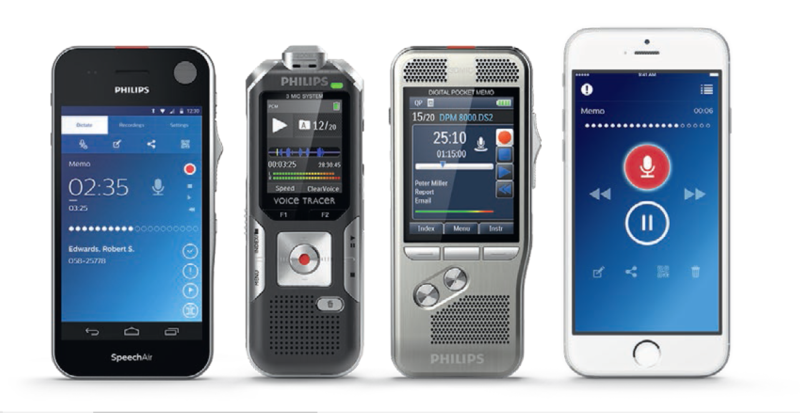 The Philips Dictation Recorder App is part of each SpeechLive subscription. No matter if you are using a voice recorder or your smartphone, you can professionally and simply record, edit and send recordings for transcription directly from your device.